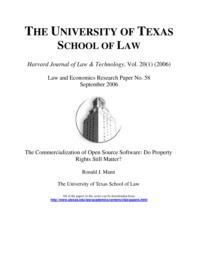 Commercializing Open Source Software: Do Property Rights Still Matter? This Article analyzes the role of patent rights in commercialized open source development models -- that is, development models that are part of business models centered on increasing shareholder returns. Section II is a brief description of the landscape of the industry and of the licenses on which open source development depends. Section III considers open source as a challenge to the “one-shop” model of proprietary software development, explaining how and why firms in some cases might profit from collaborative development through open source instead of wholly one-shop proprietary development. Finally, Section IV considers the relationship between open source and the direction and location of innovation in the industry. This Article argues that open source development is more likely to support innovation by larger and better-established firms, where proprietary development is at least relatively more accessible to startup and younger firms.